Jim starts his life story in the middle. Can you point to one incident in your life that everything else turns around? For me, it was something as simple as getting off an elevator in Sevrinson Hall in 1970. There was before, and there was after. Jim had the same kind of experience, in the back seat of a 1953 Cadillac. 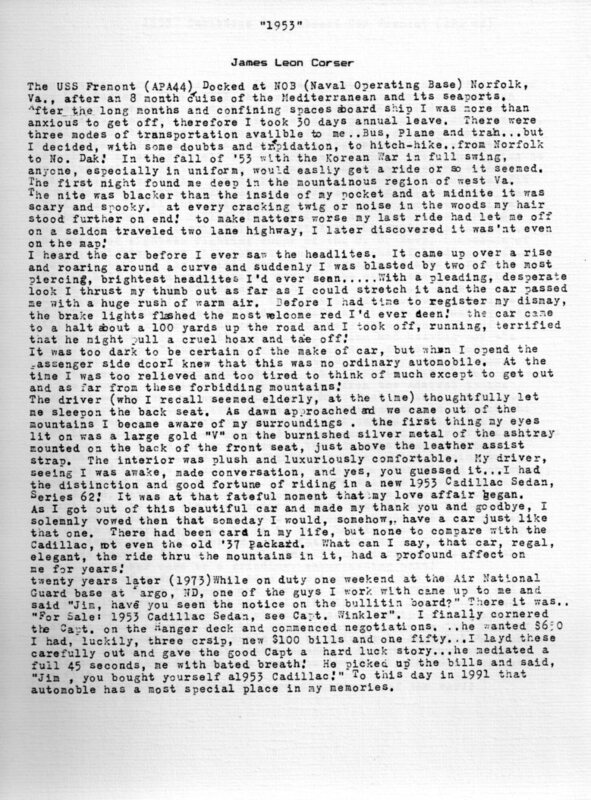 Jim starts his letters with the story of life’s cusp. In the fall of 1953 Jim’s life was changing. He had spent more than ten years in the Navy, first during the war against the Japanese in the South Pacific, and then on more mundane duty stat-side and cruising the Mediterranean Sea. Soon, life would change from military to civilian, years after most WWII veterans had made the move. After being born in North Dakota, he moved East as a child. Now, in 1953 he was preparing to move back to Dakota for an adult life. Growing up in Massachusetts and spending a decade in the Navy made an indelible imprint on Jim. He never lost the genteel nature that reminded me of Boston. He always used the slang of a Navy man. North Dakota blood flowed in his veins. The next fifty or so letters show all the traits that made him a fascinating character. 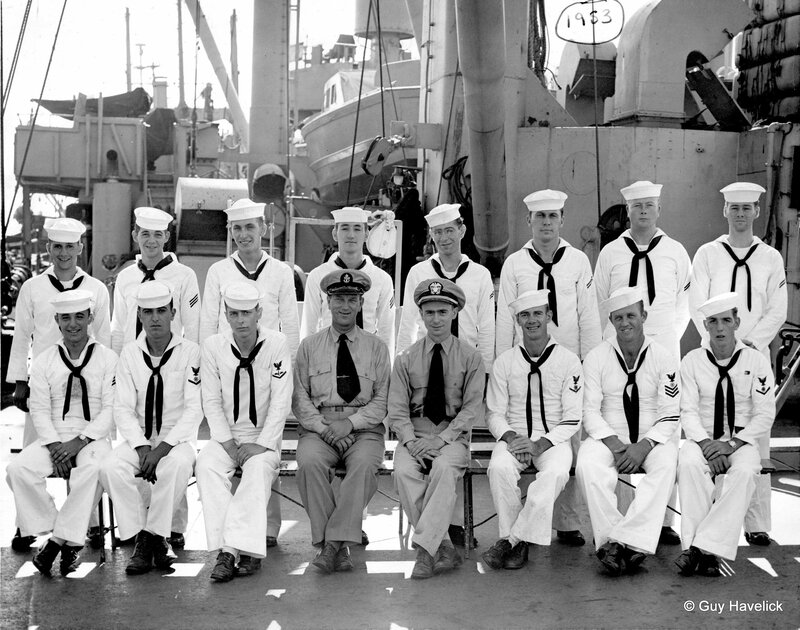 In this photo of the USS Fremont bridge crew, taken just before the events in the letter below, Jim is third from the right in the front row. The USS Fremont (APA44) docked at NOB (Naval Operations Base) Norfolk, Va. after an 8 month cruise of the Mediterranean and its seaports. After the long months and confining spaces aboard ship I was more than anxious to get off, therefore I took 30 days annual leave. There were three modes of transportation available to me … Bus, Pane and train … but I decided, with some doubts and trepidation, to hitch-hike … from Norfolk to No. Dak! In the fall of ’53 with the Korean War in full swing, anyone, especially in uniform, would easily get a ride or so it seemed. The first night found me deep in the mountainous region of west Va. The nite was blacker then the inside of my pocket and at midnite it was scary and spooky. At every cracking twig or noise in the woods my hair stood further on end! To make matters worse my last ride had let me off on a seldom traveled two lane highway, I later discovered it wasn’t even on the map! I heard the car before I ever saw the headlites. It came up over a rise and roaring around a curve and suddenly I was blasted by two of the most piercing, brightest headlites I’d ever seen … With a pleading, desperate look I thrust my thumb out as far as I could stretch it and the car passed me with a huge rush or warm air. Before I had time to register my dismay, the brake lights flashed the most welcome red I’d ever seen! The car came to a halt about a 100 yards up the road and I took off, running, terrified that he might pull a cruel hoax and take off! It was too dark to be certain of the make of car, but when I opened the passenger side door I knew that this was no ordinary automobile. At the time I was too relieved and too tired to think of much except to get ou and as far from these forbidding mountains! The driver (who I recall seemed elderly, at the time) thoughtfully let me sleep on the back seat. As dawn approached we came out of the mountains I became aware of my surroundings. The first thing my eyes lit on was a large gold “V” on the burnished silver metal of the ashtray mounted on the back of the front seat, just above the leather assist strap. The interior was plush and luxiouriously comfortable. My driver, seeing I was awake, made conversation, and yes, you guessed it … I had the distinction and good fortune of riding in a new 1953 Cadillac Sedan, Series 62. It was at that fateful moment that my love affair began. As I got out of this beautiful car and made my thank you and goodbye, I solemnly vowed that someday I would, somehow, have a car just like that one. There had been a car in my life, but none to compare with the Cadillac, not even the old ’37 Packard. What can I say, that car, regal, elegant, the ride thru the mountains in it, had a profound affect on me for years! Twenty years later (1973) while on duty one weekend at the Air National Guard base at Fargo, ND, one of the guys I work with came up to me and said “Jim, have you seen the notice on the bulletin board?” There it was … “For Sale: 1953 Cadillac Sedan, see Capt. Winkler.” I finally cornered the Capt. on the Hanger deck and commenced negotiations. He wanted $630. I had, luckily, three crisp, new $100 bills and one fifty … I layed these carefully out and gave the good Capt a hard luck story … he meditated a full 45 seconds, me with bated breath. He picked up the bills and said, “Jim, you bought yourself a 1953 Cadillac!” To this day in 1991 that automobile has a most special place in my memories. This entry was posted in Jim's Letters and tagged 1953, Cadillac, Revised, USS Fremont. Bookmark the permalink. ← What’s Going On This Weekend?